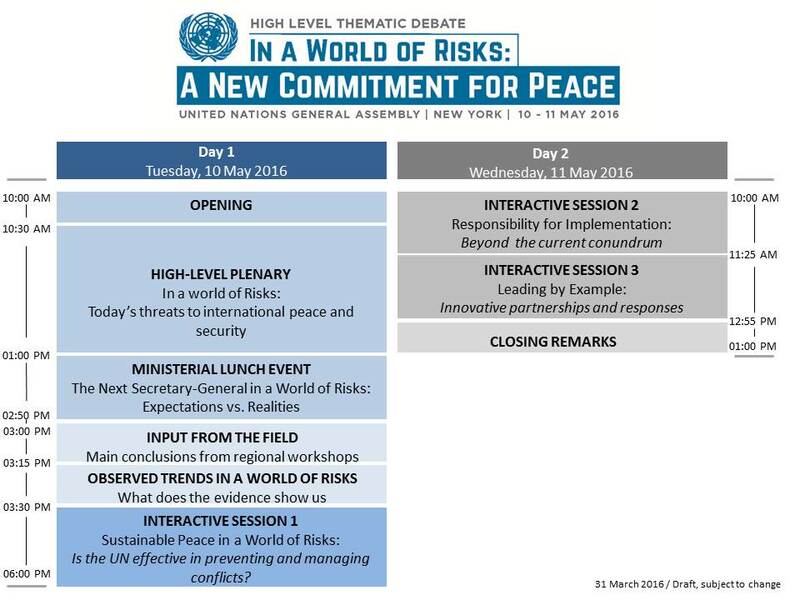 The President of the General Assembly, Mogens Lykketoft, organised a high-level Thematic Debate of the UN General Assembly, focused on UN, Peace and Security on 10-11 May 2016. This event served as a platform to identify key threats and engage in a strategic reflection about today’s challenges to international peace and security. Furthermore, it allowed for consideration about the means, tools and instruments available within a UN-context to tackle these challenges as well as the responsibilities and institutions required for an effective collective security architecture. Building on the common trends and synergies from the most recent UN peace and security reviews, including the review of UN peace operations [on the basis of both, the High Level Independent Panel on Peace Operations and the Secretary-General’s report on the future of UN peace operations], the Peacebuilding Architecture Review and the Global Study on the implementation of Security Council Resolution 1325 (2000) on women, peace and security, as well as a series of coordinated, independently organized regional workshops and seminars, the thematic debate took place as the world is considering how best to implement the ambitious and wide-ranging 2030 Agenda for Sustainable Development as well as the Paris Agreement on climate change and who – as the next Secretary-General – will lead the UN in this and other equally vital tasks. Member States were invited to participate at the highest possible level. Observers, UN entities, civil society, research institutions with global and regional reach, media, and other stakeholders also attended. The format combined a high-level plenary segment with interactive sessions, including a ministerial-level lunch on the first day, specifically designed to engage participants and to encourage reflection on how to address today’s threats and achieve sustainable peace – internationally, regionally, nationally – and how the UN system can support Member States as the primary actors. The session will focus on examples from the field looking above and beyond the most widely applied approaches, exploring examples of cross UN-system approaches to anchor peace and reconciliation. What are the unique international peace and security challenges of our time? How can the UN respond to these threats, in particular those emanating from non-state and transnational actors? Mr. David Nabarro, Special Adviser on the 2030 Agenda for Sustainable Development and Special Representative of the Secretary-General for Food Security and Nutrition, will introduce brief remarks by FAO Director-General Mr. Graziano da Silva and 2006 Nobel Peace Laureate Mr Muhammad Yunus (live streamed from Rome). The session will focus on implementation, partnerships and accountability for delivering on commitments. It will reflect on the role of all stakeholders their specific relations with the UN institutional under existing frameworks and ways to enhance the level of effectiveness. The moderator will engage all participating Ministers starting with Mr. Alain Le Roy, Secretary-General, External Action Service, European Union. 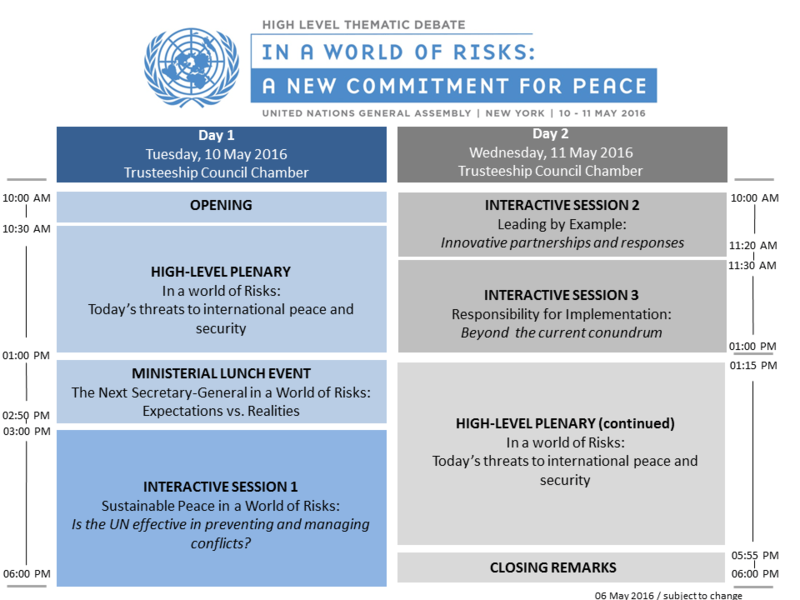 Sustainable Peace in a World of Risks: Is the UN effective in preventing and managing conflicts? The session will ask how the UN can remain the preeminent relevant actor and credibly respond to these threats, in particular those emanating from non-state and transnational actors? Are the means, instruments and policies available within a UN-context adequate to tackle today’s threats to international peace and security? Do they effectively motivate confidence in UN peace operations – and do they sufficiently incentivize coherence and consistency in support of the UN? What is needed for the UN peace and security architecture to engage new and emerging actors? Registration is closed for representatives of organizations and other stakeholders actively working in the area of peace and security from ECOSOC and non-ECOSOC accredited NGOs, civil society, the research, scientific and academic communities, youth groups and other relevant stakeholders. Policy brief 2015:5 by Alexander Illichev – addressing implementation of the HIPPO on institution and capacity-building. Policy brief 2015:4 by Hilde Johnson – addressing implications of the Hippo on protection of civilians. Beyond the UN Peace and Security Architecture: How can Enhanced Cooperation with Civil Society and Regional Organizations Help the UN to Fulfill its Purpose? ORGANIZER: The United Nations Office of the Special Adviser on Africa (OSAA), the United Nations Peacebuilding Support Office (PBSO) and the African Union Commission (AUC). For any additional information, please check our FAQ or contact us with your questions and comments by using the form below.